Hello again, my friends. Do you know how to equate heights of natural critters to buildings? I sure don’t, but these books might help you see the bigger picture. The series is called “Animals Measure Up,” and each book discusses a different ecosystem. This book focuses on flying creatures. First up is the enchanting ladybug whose gossamer wings come out from under the ladybug’s shell on her back. Next up is the Monarch butterfly which “rides” the wind and flies even higher than the ladybug. Like a scale, the creatures in this book each fly higher than the last. Next is the funny looking Frigate with its red sac hanging down from its throat. But the Andean condor has it beat, until the common place Mallard flies above it. And the bar-head goose can fly over the Himalayas. These critters all have something in common. They all take to the skies with the greatest of ease. Though stylized, the illustrations are a charming addition to the words. It would have been nice to have the Frigate bird’s red sac explained. And some of the comparison might have been made a bit clearer. Would a child be able to visualize how high a building is or high a helicopter can fly? BIBLIO: 2018, Amicus Illustrated/Amicus, Ages 5 to 8, $20.95. This book focuses on rainforest creatures. Starting below ground level, in the dark, fertile soil, you can find all kinds of critters. Centipedes, slugs, beetles, and termites “recycle” dead leaves and fertilize the soil with their waste. The bugs provide food for the forest floor animals. Armadillos dig up the below ground critters for a tasty meal, as do wild pigs and small rodents. In the understory, where smaller trees grow in what sunlight they can find by spreading their broad leaves. Squirrels, red-eyed tree frogs, birds, snakes, and jaguars makes their homes here. Way up above these creatures, is the “roof” of the forest, made up of tree branches woven together to make the canopy. Bigger animals, such as sloths and monkeys and birds, call this area home. But above them, where plenty of sun beams down, live the biggest inhabitants of all. The harpy eagle makes its home up here, as does the spider monkey. And the tree leaves here are small and waxy to capture moisture. Look closely at the illustrations in this book to see all the differences in surroundings and creatures that live there. Teachers should use more images to help their students understand the various concepts of height. The mountains are the backdrop in this book. The story starts at the lowest level, called the “grasslands” and mentions creatures such as coyotes, jackrabbits and burrowing owls that roam around the bunchgrasses and cactuses. In the foothills, a visitor will run across scrub jays which live in smaller trees capable of living in more gravelly soil. Next is the “montane” zone where rain and snow fall copiously. Shy “Albert’s” squirrels build their nests in the Ponderosa pines. Aspen trees provide food and shelter for the Rocky Mountain elk, which are especially fond of aspen bark. In the subalpine zone, you can build a snowman most of the year, but it is wet and cold so only plants like spruce and fir trees grow here. Other plants grow close to the ground and the animals are hardy. Look for snowshoe hares and boreal owls here, along with well hidden mice. At the highest level, believe it or not, some plants grow even with all the snow and cold. Here the explorer will find tiny pikas and bighorn sheep. As with the other books in this series, a bit more reference to relatable sizes would be a help. Not all children are spatially adept at imagining height differences. Still, a talented teacher can help her students understand the concepts. The illustrations, though stylized, are charming. Hello everyone, I do hope you’re having a good summer and looking for new adventures, not to mention nicer weather, in the fall. For me, most of the summer has been trying not to melt or grow moss between my toes. Here in New Bern, NC, it’s been entirely too hot for my redhead’s body to thrive, so I’ve stayed inside a great deal, reading copious numbers of books. Let me tell you, bears hibernating in the winter have no edge on me hibernating in the summer. I haven’t stuck to reading just children’s books, and, instead I’ve read a number of “grown-up” books. One that comes to mind is The Maze at Windermere, by Gregory Blake Smith. What makes it most intriguing is the author’s ability to intertwine stories taking place in Newport, RI, but in different centuries. He writes so well, that each set of characters is written in the idiom of the era. Definitely worth reading, with lots of plot intrigue within each story. I’ve also read a number of murder mysteries including the Tracy Crosswhite series by Robert Dugoni. Though you can read them as standalones, it would probably be best to start with the first in the series, My Sister’s Grave. I also read a delightful fantasy about a boy who moves to a new town with his mother, and with help of a fox, learns to navigate his new world. The book is the first in a series, but I didn’t like the second one as well. My Fox Ate my Homework is the name of the story and David Blaze is the author. Also in the children section is The Secret Zoo, by Bryan Chick, which tells the story of children trying to rescue a club member who has gone missing in a special zoo run by people intent on saving animals from going extinct. Lots of adventure in this one and amazing characters. The final book is the first novel by Laura Bradford, who is well known for her cozy mysteries set in Amish country. Portrait of a Sister is about Amish twin sister who chose separate paths. One sister choses to be “English” and the other choses to stay Amish. Ms. Bradford knows her subject well, though her connection to Amish folk is through research for her mystries. All these books, with exception of The Maze at Windermere, I read on my Kindle. The Maze I read on a copy my handsome devil had borrowed from our library. It is also available via Kindle. So, if you get caught by a hurricane or some other untoward occurrence, try reading some of these books. Happy New Year, everyone. Hope this year turns out to be the best one yet. I love animals and enjoy reading about them. Though I must admit I like some animals better than others. For instance, I don’t think it’s nice to keep reptiles as pets. It’s just a personal thing, but I keep thinking if I were a snake, I wouldn’t want to live in someone’s aquarium. The animals in the three books I’ve reviewed here are interesting and exciting to read about. Who wouldn’t want to get to know a dolphin. They are very whimsical animals and fun to watch play. How cool to be friends with a dolphin! The three friendships between a human and a dolphin described in this book give proof that humans aren’t the only intelligent creatures on this planet. The first story is about Kelly and her human friend, Tim, a marine mammal trainer, who uses whistles and fish snacks to train dolphins at the Institute for Marine Mammal Studies. Kelly, a particularly smart girl, used her intelligence to keep her group safe when they were swept out to the Gulf during Hurricane Katrina. The next story is about JoJo and his human, Dean. Dean first met a dolphin when he was only five and was rescued after being knocked over by rough waves. The dolphin nudged him back to safety. Dean’s been a fan ever since. When he was grown, a dolphin he named JoJo befriended him. Even if Dean doesn’t see JoJo for months, the next time he gets to the dolphin’s neck of the ocean they become instant friends. When JoJo was badly injured by a water biker, he trusted Dean enough to allow his friend to hold him upright so he could breathe until the dolphin was stabilized. JoJo also has a canine friend named Toffee. JoJo likes to show Dean his world and even talks to him. The final story is about Flip Nicklin who decided underwater photography was the career for him after seeing a photo of his father sitting on an injured whale’s back. Early on in his career, he discovered dolphins are pranksters and love to clown around. He enjoys playing with them. The book is full of interesting facts and wonderful photos, including some by Flip. BIBLIO: 2017, National Geographic Partners, LLC, Ages 6 to 9, $5.99. Squirrels are amusing animals to watch as they wander around our yards. They are adventuresome and comical. But flying squirrels are amazing to watch, I would think. Since 1917, Nova Scotia has sent a large spruce tree to Boston as a thank you for Boston’s help when it was needed. This particular year, they pick a tree that turns out to be the home of two flying squirrels. The squirrels are asleep when the tree is cut down and hauled to Boston. But first the tree is prayed over by a Native American tribe and other people came to watch the ceremony. The squirrels slept through the whole thing until the flatbed truck that was carrying tree and squirrels to Boston started to move. They looked around and went back to sleep. They woke up during the celebration in Halifax, but were still very tired so they went back to sleep. While riding on the ferry to Saint John Harbour, the squirrels glided all over the boat, but nobody saw them. And nobody saw them when they crossed the border into the United States, even though the guards looked. When the truck and its cargo reached Boston, the squirrels flew out of their tree and escaped a green-eyed cat. But they had to find somewhere to make a new nest. Finally, they found a tree with the perfect hole and below it was their Nova Scotia spruce tree, all lit up for Christmas. Lovely illustrations and a sweet story make this book a winner. BIBLIO: 2017, Nimbus Publishing Limited, Ages 4 to 7, $22.95. Books that add a surprising element to a classic story always tickle my imagination bone. This one gives the reader a surprising twist to Goldilocks, but also a giggle with the bear’s antics. The children could hardly wait for story time at the library, but where was the librarian? Mrs. Merryweather wasn’t at her desk. The children looked for her, but instead of footprints, they saw paw prints. Big paw prints, that took them to the solar system, the ocean, a pirate ship, and finally to her desk which was covered in honey. 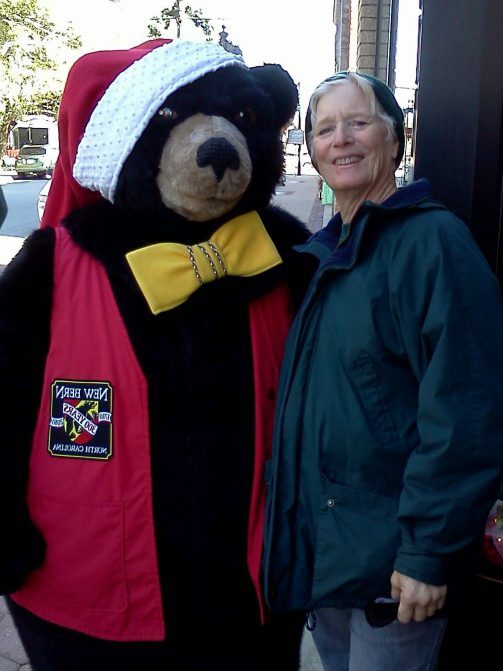 Mrs. Merryweather wasn’t there, but a bear was there as the new librarian. He read the children a scary story in which he roared. And growled. And stomped. And to top it off, he roared some more. The children loved and asked him to read it again, but Mrs. Merryweather showed up just then, explaining that an exploding volcano made a mess in the Ancient History section. Then she announced that she would read Goldilocks and the Three Bears to the children. The children all exclaimed that they loved bear stories. But when she opened the book, baby bear wasn’t in the story! He was wandering around library until the librarian ordered him back into his story. This is a sweet story about the magic of libraries. BIBLIO: 2016, Clarion Books/Houghton Mifflin Harcourt Publishing Company, Ages 4 to 6, $16.99. Here’s to a year full of new adventures, both real and imaginary. I read a great many books during a year, largely because I review children’s books for the Children’s Literature Comprehensive Database, but also because I love to read. I don’t just read books published by the “trade” and “indie” publishers, but also self-published books that I find at conferences and book-signing events. Generally speaking, the trade and indie books have some merit, though they may be in need of a more thorough edit. Sad to say, a large percentage of the self-published books should never have seen the light of day. That may be an arrogant thing to say, since I self-published my first novel, Terror’s Identity, but I did have two professional editors critique and edit the book to a fare-the-well. And I used much of their editing input to improve the story. Anyway, the two books I’m commenting on this week fall into the trade publisher category and are well worth the money or trip to your library. It is amazing the number of gifted writers floating around in our universe. John M. Cusick, whom I had the pleasure to meet the past August at the SCBWI-Carolinas’ annual conference, has written an interesting book about a teen-aged girl who loves her small town and her family. She has no ambition other than to graduate high school, marry her boyfriend, and live happily ever after. That is until she meets a movie star not much older than she, who is filming an historical-fiction movie in Cherry’s hometown. The movie star befriends Cherry and turns her upside down by introducing her to drugs and wealth and the playgirl life. All of this causes Cherry to pause and reevaluate who she is and what she should do with her life. The story is well told and intriguing, reminding us that things frequently are not what they seem to be. In the end, Cherry solve the puzzle of who she is and where she wants to end up. BIBLIO: 2013, Candlewick Press, Ages 14 +, $16.99. Gary D. Schmidt is not only an astounding teacher, but an exceptional author. This book will stay in your mind and heart for a very long time, filling you with heartbreak and joy. The story is told by Jack, who is the son of a local farmer in a small northern town. His parents take in foster children to give them a loving home, at least for a while. Their latest foster child is 13-year-old Joseph, who has already fathered a child with the love of his young life. But he’s never seen his daughter and mourns the death of his girlfriend. He is sullen–or so it would seem–angry, but turns out to have a way with cows. He goes to school with Jack, who becomes fond and protective of him. Joseph hasn’t had a happy life since his mother abandoned him and his father abuses him. The story blossoms into the bond between the two boys and then Jack’s endeavor to help Joseph find his young daughter, Jupiter, named for Joseph and his girlfriend’s favorite planet. The end of the story is bittersweet, with Joseph dying and Jack’s family adopting Jupiter. Definitely worth reading, if you haven’t already. BIBLIO: 2015, Clarion/Houghton Mifflin Harcourt Publishing Company, Ages 13 +, $9.99.